My relationship with Eagle Creek goes back almost as far as my relationship with my wife—who started as my companion on a year-long journey circling the globe back in the early ’90s. I actually went to Eagle Creek’s 40th anniversary party a few years ago because they’ve been around since 1975. I first discovered the brand through their accessories, using their various theft prevention items like a money holder that went under my pants and a cable lock that could secure our backpacks to a stationary item. They managed to foil any theft attempt except one night on an Indian train when some well-practiced robber managed to reach through a window, cut a zipper, and steal my camera while I snoozed less than two feet away. 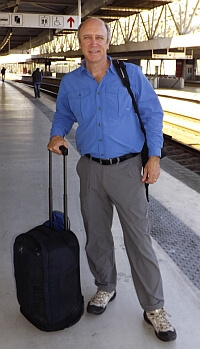 On later trips I used one of their backpacks and when I traveled with a family of three on vacation, we’ve used a whole bunch of their suitcases. I just had the first one of them crap out on me, after using it often for about a decade. See that shot to the right here? That’s me in Portugal six years ago. The rubber finally came off one wheel and I’m going to have to send it in for repair. This is the first one out of a dozen items though, which leads me to one of their main benefits: a “No Matter What” guarantee. Eagle Creek is so confident in their luggage that if your wheels fall off a few years from now, they’ll fix or replace the bag for you. The zippers, wheels, handles, and other parts are top-notch. Sometimes you do get what you pay for. This is one of the few top-tier travel gear brands that has a lifetime warranty, up there with Osprey, Tilley Hats, and Briggs & Riley. The latest bag I’ve been traveling with when I’m able to check a bag with no charges is this Gear Warrior 26-inch suitcase one with two wheels. They also make other sizes and there’s a 4-wheel version, but I find that I can move a lot faster through airports with two wheels rather than four and when you get into places that aren’t really meant for wheels, the ones like this that are the kind you see on in-line skates are far superior. These are the opposite of what you see on most four-wheel bags that are constantly breaking. This Gear Warrior version holds 65 liters of clothing and toiletries and with compression straps on the inside, you can cram a whole lot into this bag. If you buy a bunch of Eagle Creek Pack-it packing cubes and folders you can fit it eight or ten of those, including their hanging toiletry kit that I love. This suitcase is categorized as a Wheeled Duffel and you can carry it like one when you hit an area that is not meant for a wheelie suitcase. It has handles all over it in fact, so you can grab it from almost any angle. The coolest thing of all about this whole Gear Warrior line is that the fabric is made 100% from recycled plastic bottles. So not only is it tough, but you’re keeping some plastic out of landfills and our waterways. There’s a single handle that pulls out, then in that same section there’s a strap system that will hold a jacket or other small bag. Or maybe your kid’s favorite stuffed animal. The quality zippers are lockable and have pull tabs too. Internal compression straps with fabric sections keep everything in place when the baggage guys are tossing everything around. There are two sections apart from the main one: a webbed inside pocket on the flap part and then a separate compartment with another set of zippers where you can keep clothes or gear separated. There are several reflectivity parts to help you be seen at night if you’re wheeling your bag in the dark, plus the fabric is water-resistant. I’m a big fan of this brand, as you can tell by all the other bags of theirs I pull out in that video. I expect to be using this suitcase for a very long time. The Gear Warrior Wheeled Duffle in the 26-inch, 65-liter size retails for $269. See more or the Eagle Creek site or check prices online at Moosejaw. 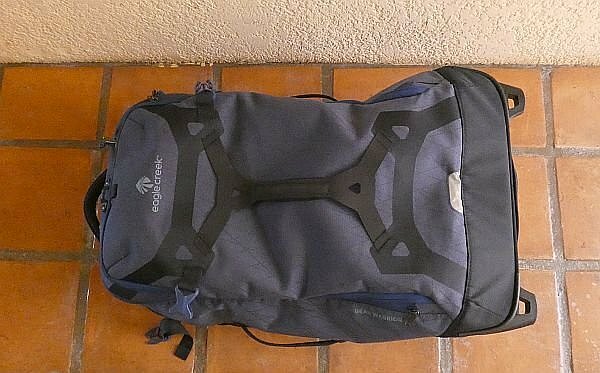 Do you have something you pack on most trips that you’ve been using for 6, 7, 10 or more years? Many of the items I use from Eagle Creek fall into that category, including this daypack below. My new friend Irene and I both received these as a schwag item at an adventure travel conference back in 2012. 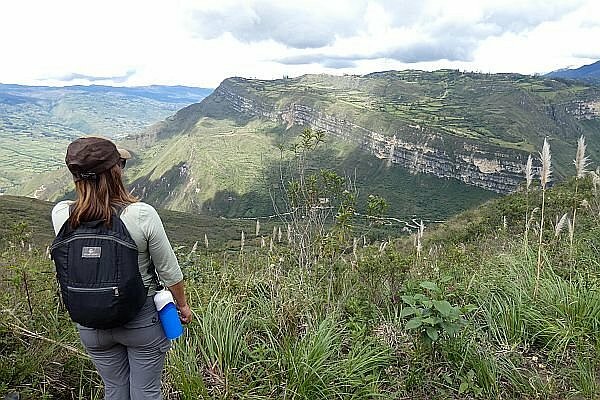 We met up in Peru this week, where we’re both still using these daypack! They pack up into a little pouch and are very sturdy. The latest version is a little fancier and doesn’t look like this, but the same principles apply: lightweight, easy to pack, and sturdy. Unlike this original model, the new one has a water bottle pouch. For my entire travel life I’ve had an Eagle Creek hanging toiletry kit along, which comes in especially handy in small bathrooms without much counter space. I also have used various items meant to foil thieves and I’m especially fond of my hidden pocket wallet that stuffs inside my pants. Eagle Creek has become especially famous for their extensive line of Pack-It cubes and pouches that help you stay organized when you’re on the move. I especially like the compression cubes that allow you to compress, say, your dirty laundry so it takes up less space when you’re traveling.